Aruch HaShulchan (Hebrew: עָרוּךְ הַשֻּׁלְחָן [or, arguably, עָרֹךְ הַשֻּׁלְחָן; see Title below]) is a chapter-to-chapter restatement of the Shulchan Aruch (the latter being the most influential codification of halakhah in the post-Talmudic era). Compiled and written by Rabbi Yechiel Michel Epstein (1829–1908), the work attempts to be a clear, organized summary of the sources for each chapter of the Shulchan Aruch and its commentaries, with special emphasis on the positions of the Jerusalem Talmud and Maimonides. The title "Aruch HaShulchan" ("the table is set") is a clear allusion to the Shulchan Aruch ("the set table"), on which it draws, and to Aroch ha-Shulchan from the Tanakh (Book of Isaiah 21:5). The Shulchan Aruch, authored in Safed by Yosef Karo in 1563, is a contemporary record of Sephardi laws and customs at the time and place of its making. Later, HaMapah ("the tablecloth"), annotations for Ashkenazi Jews by Moses Isserles, was included in all editions of the Shulchan Aruch since 1578, embedded in the text and distinguished by a semi-cursive "Rashi script". In Aruch HaShulchan, Rabbi Epstein cites the source of each law as found in the Talmud and Maimonides, and states the halakhic decision as found in the Shulchan Aruch with the glosses of Rema. When he deems it necessary, he also mentions the views of other Rishonim (early, pre-1550 authorities), and especially Acharonim (later authorities), occasionally disagreeing with the latter. The work follows the structure of the Tur and the Shulchan Aruch: A division into four large parts, subdivided into parallel chapters (simanim) that match in all three works. These are further subdivided into paragraphs (se'ifim), but the latter do not match in the three works (the Tur has no official se'ifim at all, and the se'ifim of the Shulchan Aruch do not match that of the Aruch HaShulchan). Rabbi Epstein tends to take a lenient view (le-kula) but decidedly without compromising in any form on the power and rule of Jewish law. When established custom is in conflict with theoretical halakha, Rabbi Epstein tends to side with local custom, to a greater extent than is the case in works such as the Mishnah Berurah. Rabbi Moshe Feinstein once said that the decisions of the Aruch HaShulchan — who was a full-time Rav — take precedence over many poskim who were not active rabbanim. A Rav takes into consideration more than just the abstract and black-and-white concepts of the halachah when rendering a halachic opinion. The Aruch HaShulchan is often quoted alongside the Mishnah Berurah, a work partially composed earlier by Rabbi Yisrael Meir Kagan (the Chafetz Chaim). The Aruch Hashulchan was composed and printed serially starting with Choshen Mishpat (prior to the printing of the Mishna Berurah) and the section on Orach Chayim published afterwards. Indeed, the Aruch HaShulchan refers in a number of places to the Mishnah Berurah. Due to the latter's popularity in the Haredi world, the Mishnah Berurah is often considered authoritative over Aruch HaShulchan by Haredim. However, many people (including Rabbi Yosef Eliyahu Henkin and Rabbi Yehuda Pearl) have famously held that the Aruch HaShulchan is more authoritative, since its author was the rabbi of a community, and since it was printed after the Mishnah Berurah. Also, Aruch HaShulchan has a much wider scope than the Mishnah Berurah. The work was originally published during the author's lifetime in numerous small volumes that appeared from 5644-5653 (1884–1893), beginning with Choshen Mishpat, at the beginning of which the author's introduction is found. Many volumes were reprinted posthumously by his daughter. Images of the first edition have been reprinted dozens of times to this day. These reprints usually appear in eight volumes, which mostly reflect the division of volumes in the Vilna edition of the Shulchan Aruch (with the exception of Yoreh Deah). The page numbering in the reprints still reflects the smaller volumes of the original printing. 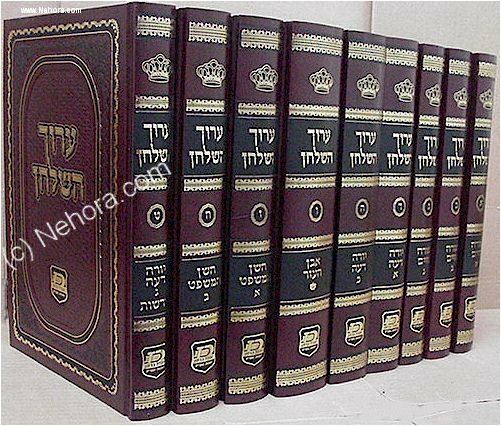 A ninth volume was published in 1992 by Rabbi Simcha Fishbane of Chicago, Illinois, who was given permission by the Israeli Bar-Ilan family, descendants of the author, to print 36 previously unpublished chapters on the laws of oaths (Hilkhot Nedarim, Yoreh Deah 203-239). These chapters were found in manuscripts by the author's own hand, along with various sermons that were published together in the same volume. Another, longer section of Yoreh Deah, which consists of 60 sections on laws connected to idolatry (123-182), is still lost. The first completely new edition of Aruch HaShulchan appeared in 5766 (2006), by "Oz Vehadar" publishers in New Square, New York. This edition adds comparisons to rulings by the Mishnah Berurah in Orach Chaim. It originally did not contain the laws of oaths (Yoreh Deah 203-239) previously published by Fishbane, but they were subsequently added. Epstein also wrote a similar work entitled Aruch HaShulchan he'Atid (Laying the Table of the Future), a parallel work to Aruch HaShulchan summarising and analysing the laws that will apply in Messianic times. Some of the laws discussed, such as those relating to agriculture and farming, apply today for those living in the Land of Israel. Zafo ha-Zafit (צפה הצפית) by Rabbi Mordecai Rabinovitch. An in-depth commentary on the laws of Hanukkah and Megillah. The commentary's title is based on the continuation of the verse from which the title Aruch ha-Shulchan is taken (Isaiah 21:5). Be'ur Halakhah (ביאור הלכה), by the Aleksander Rebbe from Cleveland, Shneur Zalmen Dancyger. Kaf hachaim by Rabbi Yaakov Chaim Sofer - a contemporaneous work discussing Orach Chayim and some of Yoreh De'ah in light of the Rishonim and Acharonim. Mishnah Berurah by Rabbi Yisrael Meir Kagan - a gloss summarizing the opinions of the Acharonim on Orach Chayim. ^ Rabinowitz, Dan (9 July 2007). "the Seforim blog: Printing of the Arukh HaShulhan: The Missing Line About Rabbi Epstein's Daughter". ^ As noted by Rabbi Meir Berlin, grandson of the author, in his introduction to the first volume of Aruch HaShulchan he'Atid.